Check out the great tutorial video on how to use Herbatint, the Safe Hair Color! 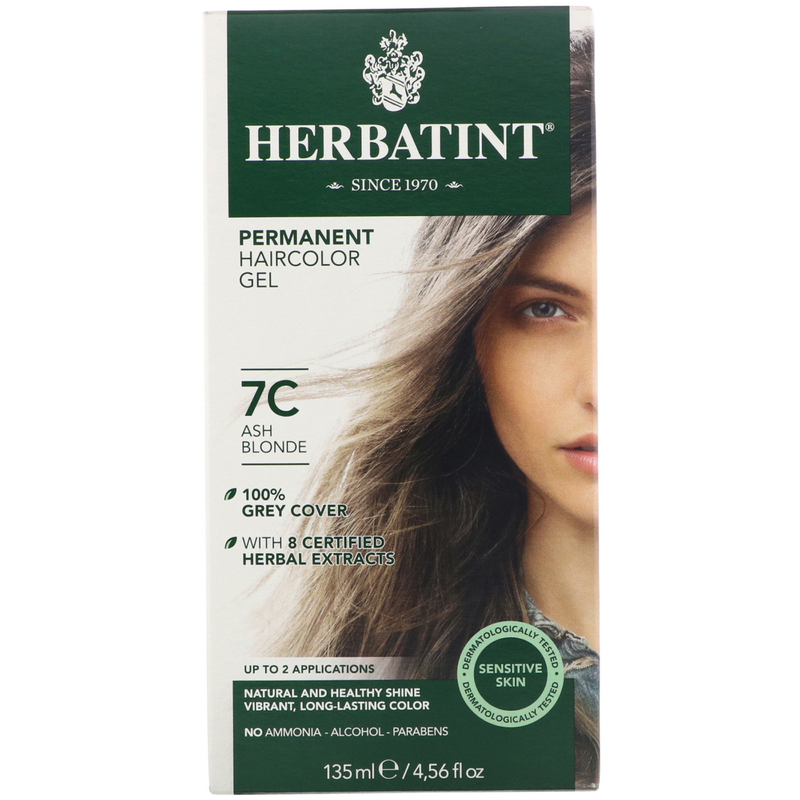 1 bottle Herbatint haircolor gel 60 ml / 2 fl oz. 1 bottle Developer 60 ml / 2 fl oz. 1 sample of Royal Cream 15 ml / 0.5 fl oz. 1 leaflet containing directions for use and gloves. A carefully balanced formulation, result of rigorous testing, achieving for each shade the perfect color result in the most gentle manner possible. The 8 organic herbal extracts, specifically selected to nourish and protect your hair and scalp, enhance your hair's color intensity and leave you with a natural, long lasting result. Your color is rich and deep, your hair looks beautiful and healthy. A Gentle Formula for Perfect Gray Coverage From the First Application! A Wide Range of Shades That You Can Personalize - Choose from 36 color shades, or mix and find your own color tone, for a more natural look. Easy to Apply - Herbatint's gel based hair color is easier than ever to mix and apply. Up to 2 Applications - Just use the amounts of color and developer you need! The leftover unmixed product can be stored for future applications. 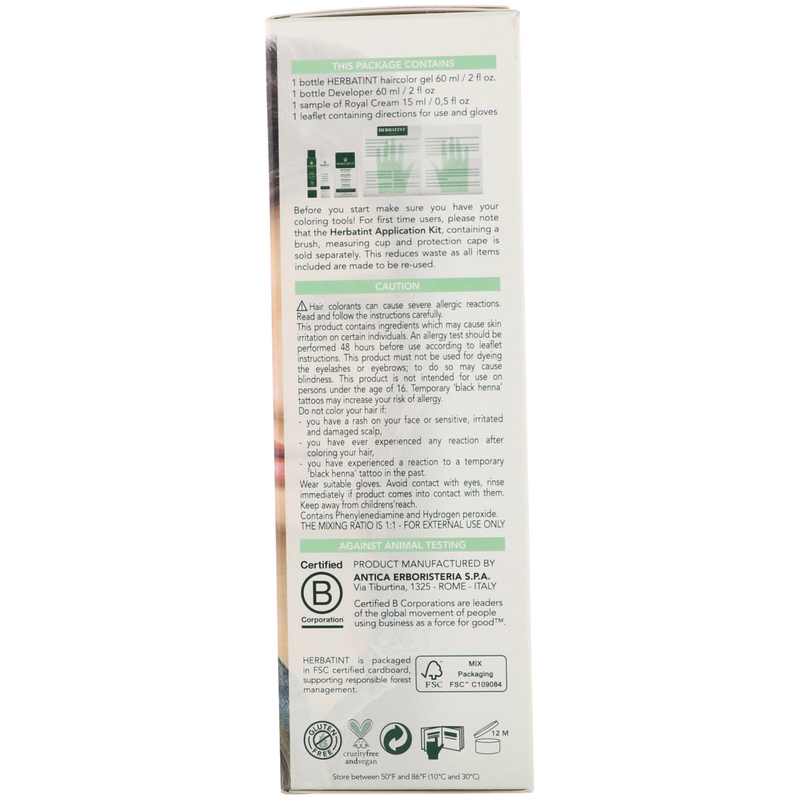 40 Minutes for a Perfect Result - Gentle and odorless formula creates a more pleasant color experience. Need to know: If you have more than 30% of grey hair and you wish to apply one of the C, D, R, or M shades, it is suggested to mix your chosen color with a N shade of the same number. Certified B Corporations are leaders of the global movement of people using business as a force for good. Before you start make sure you have your coloring tools! For first time users, please note that the Herbatint Application Kit, containing a brush, measuring cup and protection cape is sold separately. This reduces waste as all items included are made to be re-used. Herbatint haircolor gel ingredients: laureth-4, propylene glycol, aqua (water), peg-2 oleamine, ethanolamine, oleic acid, *aloe barbadensis (aloe vera) leaf extract, *hamamelis virginiana (witch hazel) leaf extract, *betula alba (birch) leaf extract, *echinacea angustifolia (echinacea) root extract, *juglans regia (walnut) shell extract, *rheum palmatum (rhubarb) root extract, *cinchona calisaya (cinchona) bark extract, peg-75 meadowfoam oil, *limnanthes alba (meadowfoam) seed oil, p-phenylenediamine, tetrasodium edta, 4-chlororesorcinol, 2-methylresorcinol, 2,4-diaminophenoxyethanol hcl, m-aminophenol, cetrimonium chloride, simethincone, sodium metabisulfite, glycerin. Developer ingredients: Aqua (water), hydrogen peroxide, etidronic acid, trideceth-9, cetrimonium chloride, simethincone, propylene glycol, peg-40 hydrogenated castor oil. Royal cream ingredients: Aqua (water), citric acid, cetyl alcohol, behentrimonium chloride, *aloe barbadensis (aloe vera) leaf juice, moringa pterygosperma (moringa) seed extract, triticum vulgare (wheat) germ oil, oryza sativa (rice) bran oil, simmondsia chinensis (jojoba) seed oil, ppg-3 benzyl ether myristate, methyl gluceth-20, ethoxydiglycol oleate, isopropyl alcohol, sodium dehydroacetate, sodium benzoate, parfum (fragrance), imidazolidinyl urea, tocopheryl acetate, glycerin. Contains phenylenediamine and hydrogen peroxide. The mixing ratio is 1:1. Caution: Hair colorants can cause severe allergic reactions. Read and follow the instructions carefully. This product contains ingredients which may cause skin irritation on certain individuals. An allergy test should be performed 48 hours before use according to leaflet instructions. This product must not be used for dyeing the eyelashes or eyebrows; to do so may cause blindness. This product is not intended for use on persons under the age of 16. Temporary 'black henna' tattoos may increase your risk of allergy. You have a rash on your face or sensitive, irritated and damaged scalp. You have ever experienced any reactions after coloring your hair. You have experienced a reaction to a temporary 'black henna' tattoo in the past. Wear suitable gloves. Avoid contact with eyes, rinse immediately if product comes into contact with them. Keep away from children's reach. Store between 50°F and 86°F (10°C and 30°C).